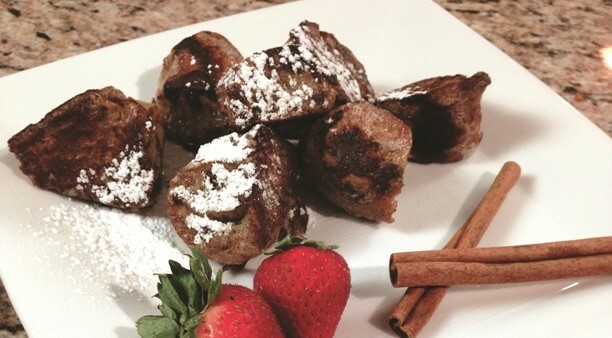 The indulgent recipe for gluten-free French Toast Bagel Bites comes from The Greater Knead (thegreaterknead.com), a Philadelphia company that makes bagels even New Yorkers praise. Younger children will need some help slicing the bagels into chunks and cooking them on the stove. But otherwise, the recipe is easy to make with a few readily available ingredients. 1. In a medium bowl, whisk together all liquid ingredients and the cinnamon. 2. Slice each bagel vertically, cutting it into chunks. 3. Place the bagel chunks into liquid mixture and stir well. Let the bagels soak to make sure they absorb some of the egg mixture. 4. Bring a large skillet to medium heat and add butter. 5. When the butter is melted, add the bagel chunks and cook until each side is browned, flipping them over a few times. 6. Remove the skillet from the heat and put bagel chunks on two plates. Add optional toppings (syrup, confectioners’ sugar, fresh fruit, etc. ).